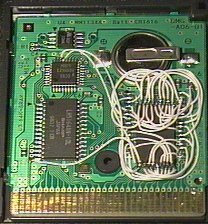 Here's the wiring diagram for putting a AMD AM29F032B 32mbit flash ROM into a GameBoy Color cart. You can get a AM29F032B-xxEx (x = don't care) from http://www.marshall.com for about US$15 + shipping. I recommend using a Zelda DX cart as it is one of the few non-Japanese carts that contains 32k bytes of cart RAM. Game & Watch Gallery 2 can be used but only has 8k bytes of cart RAM. To program the finished cart you need ReadPlus V3.25 or later.